Palms are symbolically important in the Caribbean, appearing on the coats of arms of several Caribbean nations and on the flag of the West Indies cricket team. In 2004, Carlo Morici reported that there are about 191 genera and 2339 species of Arecaceae, the palm family. Their distribution is biased toward islands - 36% of genera and 52% of species are found only on islands, while 32% of genera and 6% of species are found only on continents. Sixty-two percent of monotypic genera are found only on islands. Phytogeographically, the Caribbean region is often considered to include the coastal plains of the United States (including south Florida), Mexico (especially the Yucatan), Belize, Colombia and Venezuela. Most species either have a wide distribution which includes part of the Caribbean, or are endemic to the Greater Antilles. Of the islands in the Caribbean, Cuba has the most species of palm, followed by Hispaniola. The Windward and Leeward Islands have the fewest. The palm flora of Trinidad and Tobago consists primarily of species with a South American distribution. Three genera of palm are endemic to the Greater Antilles: Calyptronoma, Hemithrinax and Zombia. Although nearly ubiquitous in the region, the coconut (Cocos nucifera) is not native to the Caribbean. The Caribbean species in the genus Copernicia are all Greater Antillean endemics; two species are restricted to Hispaniola, while the others are restricted to Cuba. Nomenclature follows the Arecaceae section of the World Checklist of Selected Plant Families. Acoelorrhaphe is a monotypic genus which is distributed around the margins of the Caribbean Sea, from Florida to San Andrés and Providencia, Colombian islands in the western Caribbean. The tree is a slender fan palm growing up to 7 metres (23 ft) tall, usually with many stems clustered together. Acoelorrhaphe is a sister genus to Serenoa (Saw Palmetto), which is endemic to the southeastern United States. The species usually grows in low-lying areas near sea level, often in flooded woodlands or thickets in savannas. Acoelorrhaphe wrightii: Bahamas (Andros, Eleuthera, New Providence), Cuba (west Cuba and Isle of Youth), San Andrés and Providencia (Colombia); also present on the Caribbean coastal areas of south Florida, Mexico, Belize, Nicaragua and Costa Rica. Acrocomia is a genus of spiny palms found throughout the Neotropics, from Mexico to Argentina and throughout the Caribbean. Since it covers such a large range and is highly variable, as many as 40 species have been described in this genus. Most authors recognise only three species, A. aculeata, A. crispa and A. hassleri, but others considers A. media to be distinct from A. aculeata. Caribbean species have single, spiny stems 4–18 metres (13–59 ft) tall. Acrocomia aculeata: Cuba, Dominican Republic, Haiti, Jamaica, Leeward Islands, Windward Islands and Trinidad and Tobago (also Mexico, Central and South America). Acrocomia crispa: Cuba; until recently this species was considered to belong to a monotypic genus, Gastrococos. Acrocomia media: Puerto Rico and the Virgin Islands. Aiphanes is a genus of small to medium-sized spiny palms. Caribbean species have solitary stems and are 3 to 18 metres (10 to 59 ft) tall. Most of the 23 species of Aiphanes are found in the Andes; two species occur in the Caribbean, including A. minima, which is endemic to the region. Although many sources (e.g., Henderson et al. 1995) consider the name A. aculeata to have precedence over A. horrida, in keeping with the nomenclature of the World checklist, the latter name is used. Aiphanes horrida: Trinidad (also tropical South America). Aiphanes minima: Dominican Republic, Puerto Rico, Martinique, Dominica, Saint Lucia, Saint Vincent, Barbados and Grenada. Astrocaryum is a genus of spiny palms native to Mexico, Trinidad, Central and South America; the sharp, flattened spines that cover the trunk can be up to 30 cm (12 inches) long. The Caribbean species has solitary stems, 8 to 20 metres (26 to 66 ft) tall. There are about 36 species in the genus. One of them, A. aculeatum, occurs in the insular Caribbean, while four others are found in the wider Caribbean: Astrocaryum alatum on the Caribbean coast from Panama to Nicaragua, A. confertum on the Caribbean coast of Panama and Costa Rica, A. mexicanum along the Caribbean coast from Mexico to Nicaragua, and A. standleyanum on the Caribbean coast of Panama. Astrocaryum aculeatum: Trinidad (also tropical South America). Attalea is a large genus which includes some of the largest Neotropical palms. Three of the 67 species are present in the insular Caribbean, but two of these are restricted to Trinidad and Tobago which is on the continental shelf. The third species, A. crassispantha, is endemic to southwest Haiti; due to its very small population size, it is classified as a critically endangered species Three other species occur in the wider Caribbean: Attalea allenii along the Caribbean coast of Panama and Colombia, A. cohune on the Caribbean coast from Mexico to Nicaragua and A. iguadummat on the Caribbean coast of Panama. Attalea maripa: Trinidad (also tropical South America). Attalea osmantha: Trinidad and Tobago (also northern Venezuela). 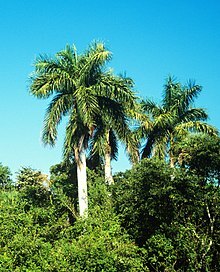 Bactris is a genus of palms which is found from southern Mexico to northern Paraguay. It is one of the largest and most diverse palm genera in the neotropics. Most species are medium-sized spiny palms with clustered stems. Most of the species present in the Caribbean are spiny trees 1 to 10 metres (3 to 33 ft) tall with clustered stems and pinnate leaves; B simplicifrons is smaller (0.5–2 m) and often has simple leaves and no spines. Seven of the 75 species in the genus Bactris occur in the insular Caribbean. Three species - B. cubensis, B. jamaicana and B. plumeriana are Greater Antillean endemics, while the other four are South American species which extend north into Trinidad and Tobago. Salzman and Judd consider the three Greater Antillean species of Bactris to form a clade with B. plumeriana and B. jamaicana as sister species. Fifteen other species occur in the wider Caribbean: Bactris barronis on the Caribbean coast of Panama and Colombia, B. caudata on the Caribbean coast from Nicaragua to Panama, B. charnleyae on the Caribbean coast of Panama, B. coloniata on the Caribbean coast of Panama, B. coloradonis on the Caribbean coast from Costa Rica to Colombia, B. gasipaes on the Caribbean coast from Mexico to Venezuela, B. glandulosa on the Caribbean coast from Costa Rica, to Colombia, B. gracilor on the Caribbean coast from Nicaragua, to Panama, B. grayumi on the Caribbean coast of Nicaragua and Costa Rica, B. guineensis on the Caribbean coast of Colombia and Venezuela, B. hondurensis along the Caribbean coast from Honduras to Colombia, B. maraja along the Caribbean coast from Costa Rica to Colombia, B. mexicana along the Caribbean coast from Belize to Nicaragua, B. militaris along the Caribbean coast of Costa Rica and B. panamensis along the Caribbean coast of Panama. Bactris campestris: Trinidad and Tobago (also tropical South America). Bactris major: Trinidad and Tobago (also Mexico to tropical South America). Bactris setulosa: Trinidad and Tobago (also Venezuela, Colombia, Ecuador and Peru). Bactris simplicifrons: Trinidad and Tobago (also tropical South America). Palms in the genus Calyptronoma have pinnately compound leaves and large, solitary stems 4 to 15 metres (13 to 49 ft) tall. The genus is endemic to the Greater Antilles, inhabiting wet areas near streams. Calyptronoma is closely related to the Central American genus Calyptrogyne. Calyptronoma plumeriana: Cuba and Hispaniola. Calyptronoma rivalis: Hispaniola and Puerto Rico. 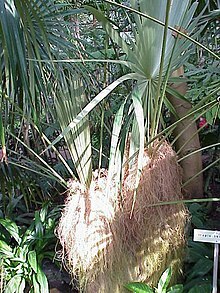 Coccothrinax is a genus of fan palms found throughout the Caribbean and in adjacent parts of southern Florida and Mexico. Most species are small to medium-sized, with maximum heights between 5 and 15 metres (17 and 49 ft). Only one of the 55 species, C. readii, is absent from the insular Caribbean. Two species, C. argentata and C. barbadensis, are widespread, while most of the others are restricted to Cuba and Hispaniola. Coccothrinax acunana: Pico Turquino, Cuba. Coccothrinax alta: Puerto Rico and the Virgin Islands. Coccothrinax argentata: Bahamas, Florida Keys and San Andrés Island (also south Florida and southeast Mexico). Coccothrinax argentea: Haiti and the Dominican Republic. Coccothrinax barbadensis: Leeward Islands, Windward Islands, Netherlands Antilles and Trinidad and Tobago. Coccothrinax borhidiana: Matanzas Province, Cuba. Coccothrinax camagueyana: east central Cuba. Coccothrinax ekmanii: Haiti and the Dominican Republic. Coccothrinax fragrans: east Cuba and Haiti. Coccothrinax garciana: Holguín Province, Cuba. Coccothrinax gracilis: Haiti and the Dominican Republic. Coccothrinax gundlachii: central and east Cuba. Coccothrinax muricata: east central Cuba. Coccothrinax pseudorigida: east central Cuba. Coccothrinax salvatoris: east and east central Cuba. Coccothrinax spissa: Haiti and the Dominican Republic. Coccothrinax trinitensis: east central Cuba. Colpothrinax is a genus of solitary-stemmed pinnate-leaved palms native to Central America and the Caribbean. There are three species of Colpothrinax: C. aphanopetala and C. cookii which are restricted to Central America, and C. wrightii which is a Cuban endemic. Colpothrinax wrightii: southwest Cuba including the Isle of Youth. Copernicia is a moderately large genus of spiny, fan palms found in the Caribbean and South America. The Caribbean species are all Greater Antillean endemics; two species are restricted to Hispaniola, while the others are restricted to Cuba. Three species are absent from the insular Caribbean: C. alba and C. prunifera, which are found in South America away from the Caribbean, and C. tectorum which is found in northern Venezuela and along the Caribbean coast of Colombia. Copernicia baileyana: east and central Cuba. Copernicia berteroana: Haiti and the Dominican Republic. Copernicia brittonorum: west and west central Cuba. Copernicia cowellii: Camagüey Province, Cuba. Copernicia glabrescens: west and west central Cuba. Copernicia macroglossa: west and central Cuba. Copernicia rigida: east and central Cuba. Desmoncus is a genus of spiny, scrambling, pinnate-leaved palms which range from Mexico in the north to Bolivia and Brazil in the south. Ten of the twelve species in have solely continental distributions. Two species are found on both the mainland and in the insular Caribbean. Desmoncus orthacanthos: Trinidad and Tobago (also tropical South America). Desmoncus polyacanthos: Saint Vincent and the Grenadines and Trinidad and Tobago (also tropical South America). Euterpe consists of seven slender-stemmed, pinnate-leaved palms native to the Caribbean, Central and South America. The genus has been described as containing "the most beautiful American palms". Four of the seven species are restricted to South America away from the Caribbean, two are found in Central and South America and the insular Caribbean, and E. broadwayi is endemic to the eastern Caribbean. Euterpe broadwayi: Dominica, Grenada, Saint Vincent and the Grenadines and Trinidad and Tobago. Euterpe oleracea: Trinidad and Tobago (also tropical South America). Euterpe precatoria: Trinidad and Tobago (also Central and South America). Gaussia is a genus of solitary, pinnate palms found in the Caribbean, northern Central America and southern Mexico. There are five species in the genus - three are endemic to the Greater Antilles, while G. gomez-pompae and G. maya are found in the Caribbean coastal region of Mexico, Belize and Guatemala. Gaussia attenuata: Dominican Republic and Puerto Rico. Gaussia spirituana: Sierra de Jatibonico in east-central Cuba. Geonoma is a genus of small to medium-sized palms which grow in the forest understorey. The genus is one of the largest in the neotropics. The genus consists of 64 species, two of which are found in the insular Caribbean. Ten other species are found in the wider Caribbean: G. chococola, G. concinna, G. divisia and G. triandra are found on the Caribbean coast of Panama, G. congesta is found along the Caribbean coast from Honduras to Colombia, G. cuneata is found along the Caribbean coast from Nicaragua to Colombia, G. deversa is found along the Caribbean coast from Belize to Colombia, G. epetiolaris and G. longevaginata are found along the Caribbean coast from Costa Rica to Panama and G. triandra is found along the Caribbean coast of Panama and Colombia. Geonoma interrupta: Haiti, Windward Islands and Trinidad and Tobago (also Mexico, Central and South America). Geonoma undata: Windward Islands (also Mexico, Central America and western tropical South America). Hemithrinax is a genus of fan palms which are endemic to Cuba. Many authors include these species in the genus Thrinax. Leucothrinax is a monotypic genus of fan palms which is native to the northern Caribbean. The species was split from the genus Thrinax after phylogenetic studies showed that its inclusion in Thrinax would render that genus paraphyletic. Leucothrinax morrisii: Florida Keys, Bahamas, Cuba, Haiti, Puerto Rico, Navassa Island and the Leeward Islands. Manicaria is a genus of pinnate-leaved palms. One species, M. saccifera is found from Belize to Brazil and Peru, while the other M. martiana is found in southeastern Colombia and northern Brazil. Manicaria saccifera: Trinidad and Tobago (also tropical Central and South America). Mauritia is a genus of fan palms which is native to northern South America. One species has a wide distribution which extends into the insular Caribbean, while the other M. carana is restricted to the Amazon region. Mauritia flexuosa: Trinidad (also tropical South America). Oenocarpus is a genus of pinnate-leaved palms found in Central and South America. Oenocarpus bataua is found in Trinidad and along the Caribbean coast of Venezuela, while O. mapora is found on the Caribbean coast of Venezuela and Panama. Oenocarpus bataua: Trinidad (also tropical Panama and South America). Prestoea is a genus of pinnate-leaved palms found in Central and South America and the Caribbean. It is closely related to the genus Euterpe. Two species are found in the Caribbean - P. pubigera is found in Trinidad, and P. acuminata is found throughout most of the Caribbean. Four other species, P. decurrens, P. ensiformis, P. longipetiolata and P. pubens are found along the Caribbean coast of Central America. Prestoea acuminata: Cuba, Dominican Republic, Haiti, Puerto Rico, Leeward Islands, Windward Islands and Trinidad and Tobago (also Central and South America). Prestoea pubigera: Trinidad (also northwest Venezuela). Pseudophoenix is a genus of pinnate-leaved palms found throughout the Caribbean. Three species are endemic to the Greater Antilles, while the fourth, P. sargentii, is widely distributed in the northern Caribbean and adjacent portions of the Central and North American mainland. Pseudophoenix sargentii: Bahamas, Cuba, Dominican Republic, Haiti, Florida Keys, Puerto Rico, Navassa Island, Turks and Caicos Islands and the Windward Islands (also Mexico and Belize). Pseudophoenix vinifera: Haiti and southwest Dominican Republic. Reinhardtia is a genus of simple or palmate-leaved palms found in the wider Caribbean, between Mexico and Colombia, with a single disjunct species which is endemic to Hispaniola. All species are small (1 to 6 metres [3 to 20 ft] tall) and inhabit the forest understorey. Reinhardtia paiewonskiana: southwest Dominican Republic. Roystonea is a genus of pinnate-leaved palms which range from south Florida and Mexico south to Venezuela. Seven species are endemic to the Greater Antilles and the Virgin Islands - four of these are Cuban endemics. The only species which is absent from the insular Caribbean, R. dunlapiana, is found on the Caribbean coast of Mexico, Honduras and Nicaragua. Roystonea borinquena: Dominican Republic, Haiti, Puerto Rico and the Virgin Islands. Roystonea oleracea: Leeward Islands, Windward Islands and Trinidad and Tobago (also Venezuela and Colombia). Roystonea regia: Bahamas, Cayman Islands and Cuba (also Florida, Mexico and Central America). Sabal is a genus of fan palms. Six of the sixteen species are native to the insular Caribbean - three of which are endemic to the Greater Antilles and the Virgin Islands. A seventh species, S. bermudana, is endemic to Bermuda. Sabal etonia and S. miamiensis are found along the Atlantic coast of Florida, S. gretheriae is found on the Caribbean coast of the Yucatan, S. mexicana is found along the Caribbean coast of Mexico into south Texas, S. minor is found along the Gulf Coast of the United States. Sabal causiarum: Haiti, Dominican Republic, Puerto Rico and the Virgin Islands. Sabal domingensis: Cuba, Haiti and the Dominican Republic. Sabal maritima: Cuba and Jamaica. Sabal mauritiiformis: Trinidad (also Mexico to Venezuela). Sabal palmetto: Bahamas, Cuba and Turks and Caicos Islands (also southeast United States). Sabal yapa: western Cuba (also Mexico and Belize). Syagrus is a genus of primarily South American palms. Thirty of the thirty-one species are South American; the other, S. amara, is endemic to the Lesser Antilles. One species, S. orinocensis is found on the Caribbean coast of Venezuela. Syagrus amara: Montserrat, Guadeloupe, Dominica, Martinique and Saint Lucia; coastal areas below 300 m.
Thrinax is a genus of fan palms. Three of the four species of are endemic to the insular Caribbean, while the fourth occurs in the insular Caribbean and in Florida, Mexico and Central America. Three species are single-island endemics - two to Jamaica and one to Cuba. Thrinax radiata: Bahamas, Cayman Islands, Cuba, Jamaica, Haiti, the Dominican Republic and Navassa Island (also Florida, Mexico and Central America). Zombia is a monotypic genus of fan palms which is endemic to Hispaniola. Individuals are up to 3 m (10 ft) tall and grow in dry, hilly regions. It is restricted to serpentine soils, at least in the Dominican Republic. Zombia antillarum: Dominican Republic and Haiti. ^ The Bahamas, Cuba, Dominica, Haiti and Trinidad and Tobago have palm trees in their coats of arms. ^ a b c d e f g Morici, Carlo (2004). "Palmeras e Islas: La Insularidad en una de las Familias más Diversas del Reino Vegetal" (PDF). J.M. Fernández-Palacios & C. Morici, Ecología Insular/Island Ecology (in Spanish). Asociación Española de Ecología Terestre (AEET)-Cabildo Insular de La Palma. pp. 81–122. Archived from the original (PDF) on 2009-02-19. Retrieved 2006-12-13. ^ a b c d e f g h i j k l m n o p q r s t u v w x y z aa ab ac ad ae af Henderson, Andrew; Gloria Galeano; Rodrigo Bernal (1995). Field Guide to the Palms of the Americas. Princeton, New Jersey: Princeton University Press. ISBN 0-691-08537-4. ^ Comeau, Paul L.; Yasmin S. Comeau; Winston Johnson (2003). The Palm Book of Trinidad and Tobago. International Palm Society. ISBN 0-9740870-0-9. ^ a b Govaerts, R.; J. Henderson; S.F. Zona; D.R. Hodel; A. Henderson (2006). "World Checklist of Arecaceae". The Board of Trustees of the Royal Botanic Gardens, Kew. Retrieved 2007-02-06. ^ "Acoelorraphe wrightii (Grisebach & H. Wendland) H. Wendland ex Beccari, Webbia. 2: 109. 1907". Flora of North America. Retrieved 2007-02-21. ^ "Acoelorraphe H. Wendland, Bot. Zeitung (Berlin). 37: 148. 1879". Flora of North America. Retrieved 2007-02-21. ^ "Acoelorrhaphe wrightii". World Checklist of Selected Plant Families. Retrieved 2006-12-08. ^ Acevedo-Rodríguez, Pedro; Mark T. Strong (2005). "Monocots and Gymnosperms of Puerto Rico and the Virgin Islands". Contributions of the United States National Herbarium. 52: 1–405. ^ "Acrocomia aculeata". World Checklist of Selected Plant Families. Retrieved 2006-12-08. ^ "Gastrococos crispa". World Checklist of Selected Plant Families. Retrieved 2009-06-15. ^ Roncal, Julissa; Scott Zona; Carl E. Lewis (2008). "Molecular Phylogenetic Studies of Caribbean Palms (Arecaceae) and Their Relationships to Biogeography and Conservation". Botanical Review. 74 (1): 78–102. doi:10.1007/s12229-008-9005-9. ^ "Acrocomia media". World Checklist of Selected Plant Families. Retrieved 2006-12-08. This species is considered valid by "Acevedo-Rodríguez & Strong (2005)". but not by "Govaerts (1995) and Govaerts & Dransfield (2005)]". ^ a b "Aiphanes horrida". World Checklist of Selected Plant Families. Retrieved 2006-12-08. ^ "Aiphanes minima". World Checklist of Selected Plant Families. Retrieved 2006-12-08. ^ "Astrocaryum aculeatum". World Checklist of Selected Plant Families. Retrieved 2006-12-08. ^ Johnson, D. (1988). "Attalea crassispatha". IUCN Red List of Threatened Species. Version 2006. International Union for Conservation of Nature. Retrieved February 22, 2007. ^ "Attalea crassispatha". World Checklist of Selected Plant Families. Retrieved 2006-12-08. ^ "Attalea maripa". World Checklist of Selected Plant Families. Retrieved 2006-12-08. ^ "Attalea osmantha". World Checklist of Selected Plant Families. Retrieved 2006-12-08. ^ Salzman, V.T. ; Judd, W.S. (1995). "A revision of the Greater Antillean species of Bactris (Bactridinae: Arecaceae)". Brittonia. 47 (4): 345–371. doi:10.2307/2807563. ^ "Bactris campestris". World Checklist of Selected Plant Families. Retrieved 2006-12-08. ^ "Bactris cubensis". World Checklist of Selected Plant Families. Retrieved 2006-12-08. ^ "Bactris jamaicana". World Checklist of Selected Plant Families. Retrieved 2006-12-08. ^ "Bactris major". ; "Bactris major var. major". World Checklist of Selected Plant Families. Retrieved 2006-12-08. ^ "Bactris plumeriana". World Checklist of Selected Plant Families. Retrieved 2006-12-08. ^ "Bactris setulosa". World Checklist of Selected Plant Families. Retrieved 2006-12-08. ^ "Bactris simplicifrons". World Checklist of Selected Plant Families. Retrieved 2006-12-08. ^ "Calyptronoma occidentalis". World Checklist of Selected Plant Families. Retrieved 2006-12-08. ^ "Calyptronoma plumeriana". World Checklist of Selected Plant Families. Retrieved 2006-12-08. ^ "Calyptronoma rivalis". World Checklist of Selected Plant Families. Retrieved 2006-12-08. ^ Jestrow, Brett; Peguero, Brígido; Jiménez, Francisco; Verdecia, Raúl; González-Oliva, Lisbet; Moya, Celio E.; Cinea, William; Griffith, M. Patrick; Meerow, Alan W. (2018). "A conservation framework for the Critically Endangered endemic species of the Caribbean palm Coccothrinax". Oryx. 52 (03): 452–463. doi:10.1017/S0030605317000588. ISSN 0030-6053. ^ "Coccothrinax acuminata". World Checklist of Selected Plant Families: Royal Botanic Gardens, Kew. Retrieved 2019-02-22. ^ "Coccothrinax acunana". World Checklist of Selected Plant Families. Retrieved 2006-12-08. ^ "Coccothrinax alexandri". ; "Coccothrinax alexandri subsp. alexandri". ; "Coccothrinax alexandri subsp. nitida". World Checklist of Selected Plant Families. Retrieved 2006-12-08. ^ "Coccothrinax alta". World Checklist of Selected Plant Families. Retrieved 2006-12-08. ^ "Coccothrinax argentata". World Checklist of Selected Plant Families. Retrieved 2006-12-08. ^ a b Wunderlin, Richard P.; Bruce F. Hansen (2003). Guide to the Vascular Plants of Florida (Second ed.). Gainesville: University Press of Florida. ISBN 0-8130-2632-6. ^ "Coccothrinax argentea". World Checklist of Selected Plant Families. Retrieved 2006-12-08. ^ "Coccothrinax baracoensis". World Checklist of Selected Plant Families. Retrieved 2006-12-08. ^ "Coccothrinax barbadensis". World Checklist of Selected Plant Families. Retrieved 2006-12-08. ^ "Coccothrinax bermudezii". World Checklist of Selected Plant Families. Retrieved 2006-12-08. ^ "Coccothrinax borhidiana". World Checklist of Selected Plant Families. Retrieved 2006-12-08. ^ "Coccothrinax boschiana". World Checklist of Selected Plant Families. Retrieved 2006-12-08. ^ "Coccothrinax camagueyana". World Checklist of Selected Plant Families. Retrieved 2006-12-08. ^ "Coccothrinax clarensis". ; "Coccothrinax clarensis subsp. brevifolia". ; "Coccothrinax clarensis subsp. clarensis". ; "Coccothrinax clarensis subsp. perrigida". World Checklist of Selected Plant Families. Retrieved 2006-12-08. ^ "Coccothrinax concolor". World Checklist of Selected Plant Families. Retrieved 2006-12-08. ^ "Coccothrinax crinita". ; "Coccothrinax crinita subsp. brevicrinis". ; "Coccothrinax crinita subsp. crinita". World Checklist of Selected Plant Families. Retrieved 2006-12-08. ^ "Coccothrinax cupularis". World Checklist of Selected Plant Families. Retrieved 2006-12-08. ^ "Coccothrinax ekmanii]". World Checklist of Selected Plant Families. Retrieved 2006-12-08. ^ "Coccothrinax elegans". World Checklist of Selected Plant Families. Retrieved 2006-12-08. ^ "Coccothrinax fagildei". World Checklist of Selected Plant Families. Retrieved 2006-12-08. ^ "Coccothrinax fragrans". World Checklist of Selected Plant Families. Retrieved 2006-12-08. ^ "Coccothrinax garciana". World Checklist of Selected Plant Families. Retrieved 2006-12-08. ^ "Coccothrinax gracilis". World Checklist of Selected Plant Families. Retrieved 2006-12-08. ^ "Coccothrinax guantanamensis". World Checklist of Selected Plant Families. Retrieved 2006-12-08. ^ "Coccothrinax gundlachii". World Checklist of Selected Plant Families. Retrieved 2006-12-08. ^ "Coccothrinax hioramii ". World Checklist of Selected Plant Families. Retrieved 2006-12-08. ^ "Coccothrinax inaguensis". World Checklist of Selected Plant Families. Retrieved 2006-12-08. ^ "Coccothrinax jamaicensis". World Checklist of Selected Plant Families. Retrieved 2006-12-08. ^ "Coccothrinax jimenezii". World Checklist of Selected Plant Families: Royal Botanic Gardens, Kew. Retrieved 2019-02-22. ^ "Coccothrinax leonis". World Checklist of Selected Plant Families. Retrieved 2006-12-08. ^ "Coccothrinax litoralis". World Checklist of Selected Plant Families. Retrieved 2006-12-08. ^ "Coccothrinax macroglossa". World Checklist of Selected Plant Families. Retrieved 2006-12-08. ^ "Coccothrinax microphylla". World Checklist of Selected Plant Families. Retrieved 2006-12-08. ^ "Coccothrinax miraguama". "Coccothrinax miraguama subsp. arenicola". "Coccothrinax miraguama subsp. havanensis". "Coccothrinax miraguama subsp. miraguama". "Coccothrinax miraguama subsp. roseocarpa". World Checklist of Selected Plant Families. Retrieved 2006-12-08. ^ "Coccothrinax moaensis". World Checklist of Selected Plant Families. Retrieved 2006-12-08. ^ "Coccothrinax montana". World Checklist of Selected Plant Families. Retrieved 2006-12-08. ^ "Coccothrinax munizii". World Checklist of Selected Plant Families. Retrieved 2006-12-08. ^ "Coccothrinax muricata". World Checklist of Selected Plant Families. Retrieved 2006-12-08. ^ "Coccothrinax nipensis". World Checklist of Selected Plant Families. Retrieved 2006-12-08. ^ "Coccothrinax orientalis". World Checklist of Selected Plant Families. Retrieved 2006-12-08. ^ "Coccothrinax pauciramosa". World Checklist of Selected Plant Families. Retrieved 2006-12-08. ^ "Coccothrinax proctorii". World Checklist of Selected Plant Families. Retrieved 2006-12-08. ^ "Coccothrinax pseudorigida". World Checklist of Selected Plant Families. Retrieved 2006-12-08. ^ "Coccothrinax pumila". World Checklist of Selected Plant Families. Retrieved 2006-12-08. ^ "Coccothrinax rigida". World Checklist of Selected Plant Families. Retrieved 2006-12-08. ^ "Coccothrinax salvatoris". "Coccothrinax salvatoris subsp. loricata". World Checklist of Selected Plant Families. Retrieved 2006-12-08. ^ "Coccothrinax saxicola". World Checklist of Selected Plant Families. Retrieved 2006-12-08. ^ "Coccothrinax scoparia". World Checklist of Selected Plant Families. Retrieved 2006-12-08. ^ "Coccothrinax spirituana". World Checklist of Selected Plant Families: Royal Botanic Gardens, Kew. Retrieved 2019-02-22. ^ "Coccothrinax spissa". World Checklist of Selected Plant Families. Retrieved 2006-12-08. ^ Morici, Carlo; Raúl Verdecia Pérez (2006). "Coccothrinax torrida (Arecaceae), a new species from southeastern Cuba". Brittonia. 58 (2): 189–193. doi:10.1663/0007-196X(2006)58[189:CTAANS]2.0.CO;2. Retrieved 2007-01-13. ^ "Coccothrinax trinitensis". World Checklist of Selected Plant Families. Retrieved 2006-12-08. ^ "Coccothrinax victorini ". World Checklist of Selected Plant Families. Retrieved 2006-12-08. ^ "Coccothrinax yunquensis". World Checklist of Selected Plant Families. Retrieved 2006-12-08. ^ "Coccothrinax yuraguana". World Checklist of Selected Plant Families. Retrieved 2006-12-08. ^ "Colpothrinax aphanopetala". World Checklist of Selected Plant Families. Retrieved 2007-01-11. ^ "Colpothrinax cookii". World Checklist of Selected Plant Families. Retrieved 2007-01-11. ^ "Colpothrinax wrightii". World Checklist of Selected Plant Families. Retrieved 2006-12-08. ^ "Copernicia alba". World Checklist of Selected Plant Families. Retrieved 2006-01-12. ^ "Copernicia prunifera". World Checklist of Selected Plant Families. Retrieved 2006-01-12. ^ "Copernicia tectorum". World Checklist of Selected Plant Families. Retrieved 2006-01-12. ^ "Copernicia baileyana". World Checklist of Selected Plant Families. Retrieved 2006-12-08. ^ "Copernicia berteroana". World Checklist of Selected Plant Families. Retrieved 2006-12-08. ^ "Copernicia brittonorum". World Checklist of Selected Plant Families. Retrieved 2006-12-08. ^ "Copernicia × burretiana". World Checklist of Selected Plant Families. Retrieved 2006-12-08. ^ "Copernicia cowellii". World Checklist of Selected Plant Families. Retrieved 2006-12-08. ^ "Copernicia curbeloi". World Checklist of Selected Plant Families. Retrieved 2006-12-08. ^ "Copernicia curtissii". World Checklist of Selected Plant Families. Retrieved 2006-12-08. ^ "Copernicia ekmanii". World Checklist of Selected Plant Families. Retrieved 2006-12-08. ^ "Copernicia × escarzana ". World Checklist of Selected Plant Families. Retrieved 2006-12-08. ^ "Copernicia fallaensis". World Checklist of Selected Plant Families. Retrieved 2006-12-08. ^ "Copernicia gigas". World Checklist of Selected Plant Families. Retrieved 2006-12-08. ^ "Copernicia glabrescens". "Copernicia glabrescens var. glabrescens". "Copernicia glabrescens var. ramosissima". World Checklist of Selected Plant Families. Retrieved 2006-12-08. ^ "Copernicia hospita". World Checklist of Selected Plant Families. Retrieved 2006-12-08. ^ "Copernicia humicola". World Checklist of Selected Plant Families. Retrieved 2006-12-08. ^ "Copernicia longiglossa". World Checklist of Selected Plant Families. Retrieved 2006-12-08. ^ "Copernicia macroglossa". World Checklist of Selected Plant Families. Retrieved 2006-12-08. ^ "Copernicia molineti". World Checklist of Selected Plant Families. Retrieved 2006-12-08. ^ "Copernicia × occidentalis". World Checklist of Selected Plant Families. Retrieved 2006-12-08. ^ "Copernicia rigida". World Checklist of Selected Plant Families. Retrieved 2006-12-08. ^ "Copernicia roigii". World Checklist of Selected Plant Families. Retrieved 2006-12-08. ^ "Copernicia × shaferi". World Checklist of Selected Plant Families. Retrieved 2006-12-08. ^ "Copernicia × sueroana". World Checklist of Selected Plant Families. Retrieved 2006-12-08. ^ "Copernicia × textilis". World Checklist of Selected Plant Families. Retrieved 2006-12-08. ^ "Copernicia × vespertilionum". World Checklist of Selected Plant Families. Retrieved 2006-12-08. ^ "Copernicia yarey". World Checklist of Selected Plant Families. Retrieved 2006-12-08. ^ "Desmoncus orthacanthos". World Checklist of Selected Plant Families. Retrieved 2006-12-08. ^ "Desmoncus polyacanthos". "Desmoncus polyacanthos var. polyacanthos". World Checklist of Selected Plant Families. Retrieved 2006-12-08. ^ a b Henderson, Andrew; Gloria Galeano (December 1996). "Euterpe, Prestoea, and Neonicholsonia (Palmae)". Flora Neotropica. 72. ^ "Euterpe broadwayi". World Checklist of Selected Plant Families. Retrieved 2006-12-08. ^ "Euterpe oleracea". World Checklist of Selected Plant Families. Retrieved 2006-12-08. ^ "Euterpe precatoria". "Euterpe precatoria var. precatoria". World Checklist of Selected Plant Families. Retrieved 2006-12-08. ^ "Gaussia attenuata". World Checklist of Selected Plant Families. Retrieved 2006-12-08. ^ "Gaussia princeps". World Checklist of Selected Plant Families. Retrieved 2006-12-08. ^ "Gaussia spirituana". World Checklist of Selected Plant Families. Retrieved 2006-12-08. ^ "Geonoma interrupta". "Geonoma interrupta var. interrupta". World Checklist of Selected Plant Families. Retrieved 2006-12-08. ^ "Geonoma undata". World Checklist of Selected Plant Families. Retrieved 2006-12-08. ^ "Hemithrinax compacta". World Checklist of Selected Plant Families. Retrieved 2006-12-08. ^ "Hemithrinax rivularis". "Hemithrinax rivularis var. rivularis". "Hemithrinax rivularis var. savannarum". World Checklist of Selected Plant Families. Retrieved 2006-12-08. ^ Lewis, Carl E.; Scott Zona (2008). "Leucothrinax morrisii, a new name for a familiar Caribbean palm". Palms. 52 (2): 84–88. ^ "Leucothrinax morrisii". World Checklist of Selected Plant Families. Retrieved 2009-03-24. ^ a b c Zanoni, Thomas A.; William R. Buck (1999). "Navassa Island and Its Flora. 2. Checklist of the Vascular Plants". Brittonia. New York Botanical Garden Press. 51 (4): 389–394. doi:10.2307/2666520. JSTOR 2666520. ^ "Manicaria martiana". World Checklist of Selected Plant Families. Retrieved 2019-02-24. ^ "Manicaria saccifera". World Checklist of Selected Plant Families. Retrieved 2006-12-08. ^ "Mauritia flexuosa". World Checklist of Selected Plant Families. Retrieved 2006-12-08. ^ "Oenocarpus bataua". "Oenocarpus bataua var. oligocarpus". World Checklist of Selected Plant Families. Retrieved 2006-12-08. ^ "Prestoea acuminata". "Prestoea acuminata var. montana". World Checklist of Selected Plant Families. Retrieved 2006-12-08. ^ "Prestoea pubigera". World Checklist of Selected Plant Families. Retrieved 2006-12-08. ^ "Pseudophoenix ekmanii". World Checklist of Selected Plant Families. Retrieved 2006-12-08. ^ "Pseudophoenix lediniana". World Checklist of Selected Plant Families. Retrieved 2006-12-08. ^ "Pseudophoenix sargentii". World Checklist of Selected Plant Families. Retrieved 2006-12-08. ^ "Pseudophoenix vinifera". World Checklist of Selected Plant Families. Retrieved 2006-12-08. ^ "Reinhardtia paiewonskiana". World Checklist of Selected Plant Families. Retrieved 2006-12-08. ^ Zona, Scott (December 1996). "Roystonea (Arecaceae: Arecoideae)". Flora Neotropica. 71. ^ "Roystonea altissima". World Checklist of Selected Plant Families. Retrieved 2006-12-08. ^ "Roystonea borinquena". World Checklist of Selected Plant Families. Retrieved 2006-12-08. ^ "Roystonea lenis". World Checklist of Selected Plant Families. Retrieved 2006-12-08. ^ "Roystonea maisiana". World Checklist of Selected Plant Families. Retrieved 2006-12-08. ^ "Roystonea oleracea". World Checklist of Selected Plant Families. Retrieved 2006-12-08. ^ "Roystonea princeps". World Checklist of Selected Plant Families. Retrieved 2006-12-08. ^ "Roystonea regia". World Checklist of Selected Plant Families. Retrieved 2006-12-08. ^ "Roystonea stellata". World Checklist of Selected Plant Families. Retrieved 2006-12-08. ^ "Roystonea violacea". World Checklist of Selected Plant Families. Retrieved 2006-12-08. ^ "Sabal causiarum". World Checklist of Selected Plant Families. Retrieved 2006-12-08. ^ "Sabal domingensis". World Checklist of Selected Plant Families. Retrieved 2006-12-08. ^ "Sabal maritima". World Checklist of Selected Plant Families. Retrieved 2006-12-08. ^ "Sabal mauritiiformis". World Checklist of Selected Plant Families. Retrieved 2006-12-08. ^ "Sabal palmetto". World Checklist of Selected Plant Families. Retrieved 2006-12-08. ^ "Sabal yapa". World Checklist of Selected Plant Families. Retrieved 2006-12-08. ^ "Syagrus amara". World Checklist of Selected Plant Families. Retrieved 2006-12-08. ^ "Thrinax ekmaniana". World Checklist of Selected Plant Families. Retrieved 2006-12-08. ^ "Thrinax excelsa". World Checklist of Selected Plant Families. Retrieved 2006-12-08. ^ "Thrinax parviflora". "Thrinax parviflora subsp. parviflora". "Thrinax parviflora subsp. puberula". World Checklist of Selected Plant Families. Retrieved 2006-12-08. ^ "Thrinax radiata". World Checklist of Selected Plant Families. Retrieved 2006-12-08. ^ Taylor, Fabienne Boncy; Joel C. Timyan (2004). "Notes on Zombia antillarum". Economic Botany. 58 (2): 173–183. doi:10.1663/0013-0001(2004)058[0179:NOEP]2.0.CO;2. ISSN 0013-0001. ^ "Zombia antillarum". World Checklist of Selected Plant Families. Retrieved 2006-12-08. This page was last edited on 24 April 2019, at 04:15 (UTC).